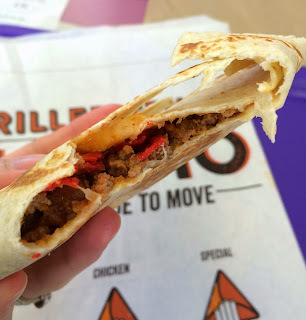 I went to Taco Bell to try the newest and spiciest sauce "Diablo," that was launched for Cinco de Mayo, but the branch we went to had no Diablo left. 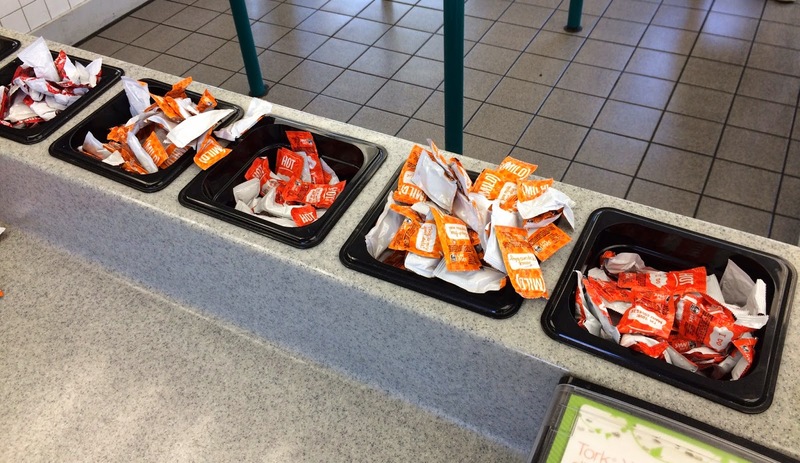 When my husband asked the manager, he said a limited number was available for Cinco de Mayo but would bring back the sauce the following Tuesday. 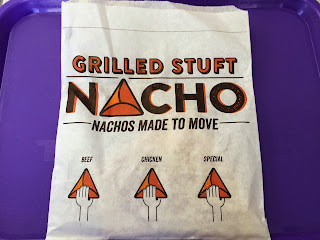 We found a new product called "Grilled Stuft Nacho" so we decided to get it instead of a hardshell taco with Diablo, that was my original plan. 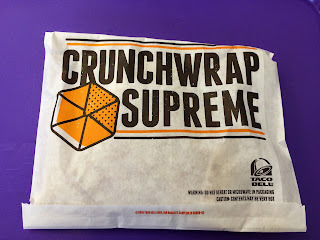 Apparently, it's launched early in 2014 but it's my first time to see and try this product. 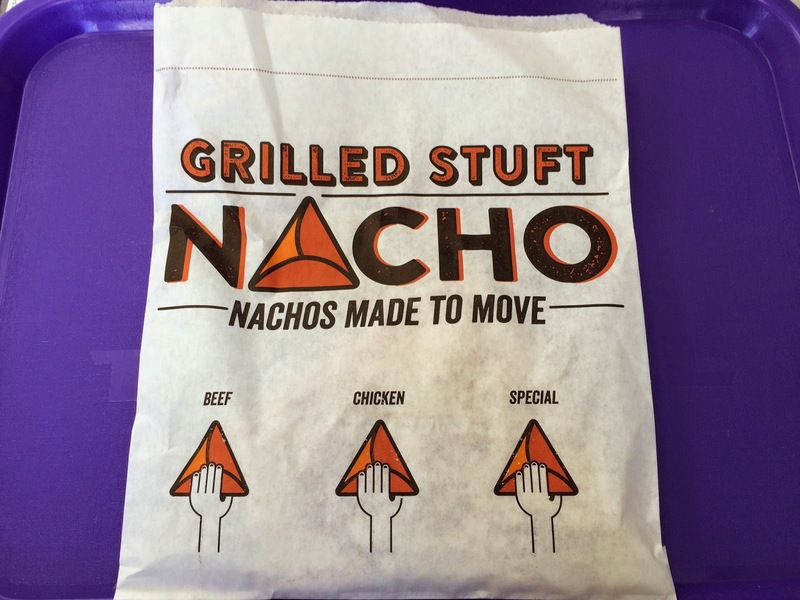 And it's a limited item at participating locations with a choice of chicken or beef. By the way, this is what Taco Bell is supposed to be; you can grab as much sauce as you want unlike Taco Bell in Japan. 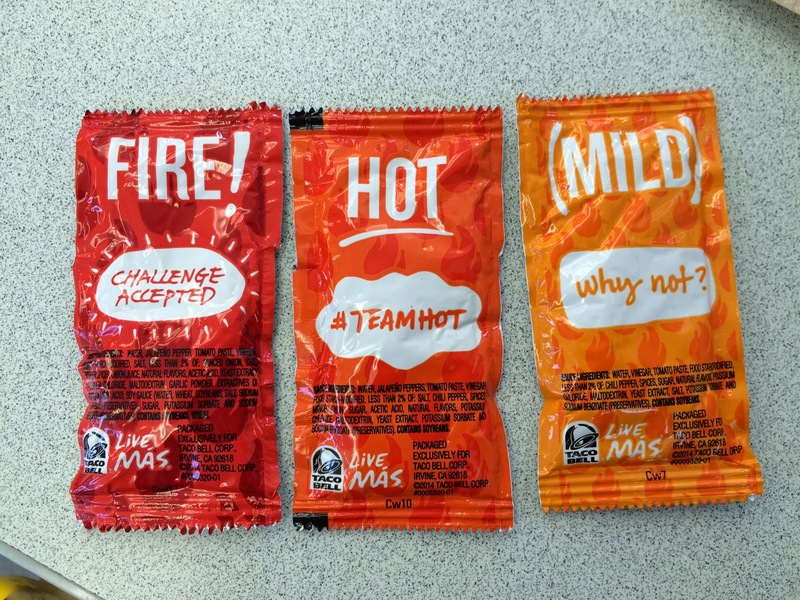 I got Fire, Hot and Mild one each. 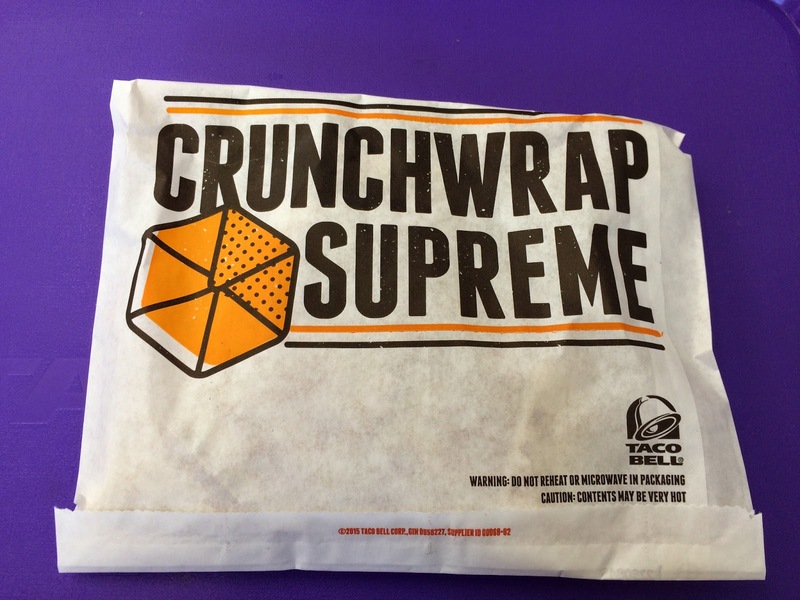 It's in a paper bag of "Crunchwrap Supreme." 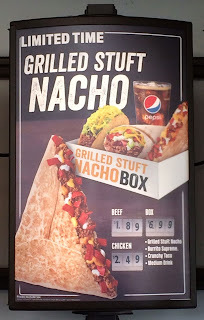 But on the other side, it actually said, "Grilled Stuft Nacho." We wonder what "Special" meant --- do they have crazy filling? 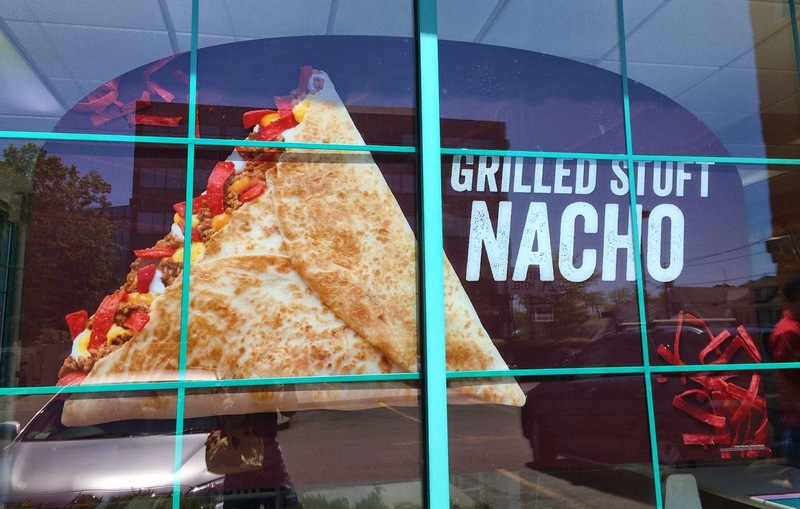 Actual product we got didn't look like the advertisement photo but a hat like Arby's. I opened the "triangle" to see the fillings. There're red corn tortilla chips, sour cream, warm nacho cheese sauce and seasoned ground beef. I added 3 kinds of sauce I grabbed and used about a half the pouch each. 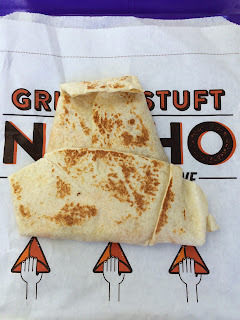 It tasted like as it looked; grilled toasty soft shell, seasoned beef, crunchy corn tortilla chips, creamy sour cream and warm cheese sauce. 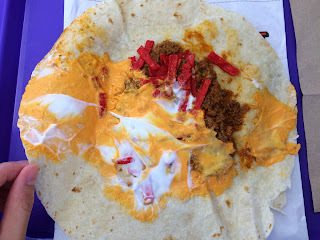 Like other items at Taco Bell, the sour cream was low fat and it's light, and cheese sauce and tortilla chips had saltiness. 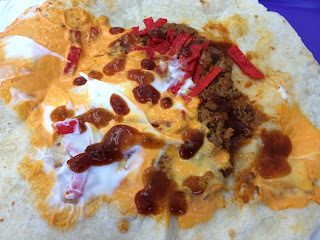 I mixed the 3 sauces so that I couldn't tell what each flavor was, but some had sourness similar to Tabasco. 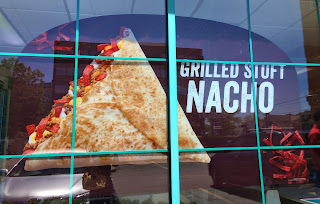 Though it says "Fire," it didn't do anything. 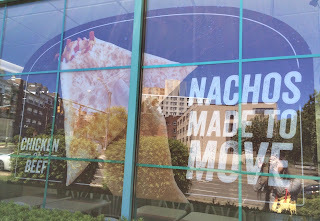 * Limited time only at participating locations.